2015 Current Motor Nb Cargo. Picture credits - Current Motor. Submit more pictures. 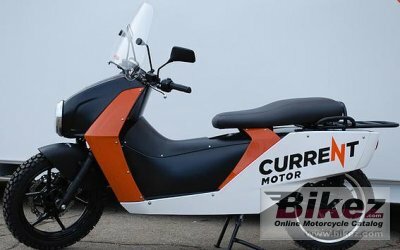 Current Motor�s completely redesigned, Nb Electric Cargo Motorcycle, is a 100% electric, zero emissions vehicle with very low maintenance requirements (no belts, chains or gears). The Nb has a top speed of 70 mph, and can go up to 50 miles per charge. The Nb�s frame has been made stronger to carry more cargo (a driver and substantial cargo or 2 passengers and light cargo), and is 31% lighter to improve performance through the use of High Strength Niobium (Nb) micro-alloyed steel. Comments: Optional solar charging station. GPS. Windscreen. Range 50 miles. Lithium Iron Manganese Phosphate (LifeMnPO4) battery. 5 hour recharge time. 2,000+ discharge/recharge cycles. Computer controlled regenerative braking. Various options. Ask questions Join the 15 Current Motor Nb Cargo discussion group or the general Current Motor discussion group. Bikez.com has a discussion group for every motorcycle. Here you may find answers to common questions about the model. If you do not find what you are looking for, you can ask questions. Try out the 2015 Current Motor Nb Cargo discussion forum. You can sign up for e-mail notifications when other users answer you. If you have information about any technical issue related to this motorcycle, please leave a comment for other riders.